This excellent pressure-relieving mattress is simple but very effective. 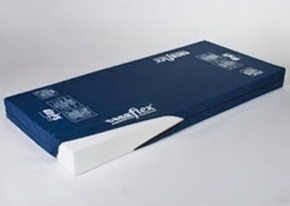 It's made with a single block of foam with a two-way stretch cover for maximum comfort and reduced risk of pressure ulcers and discomfort. It is best suited to sleepers under 185kg (407lb), with a low to medium risk of pressure-related problems (Waterlow score 15). It's 127mm or 5" deep. Casa Single Block Foam Pressure Relieving Mattress is for those who don't need a full pressure-relief bed, a foam pressure reliving mattress like this one is the perfect option. It's budget-conscious, beautifully simple, and will maintain comfort and safety with ease.